Some call them pen drives, memory sticks (sorry Sony!) or even memory keys, but an equally common name for a portable USB memory device has been taken one step further by Japanese manufacturer, Solid Alliance. Yes, what you're looking at is, quite literally, a Thumb Drive. Eerily realistic in their appearance, they are available in both male and female versions, the latter sporting appropriate fingernail bling. The Solid Alliance Thumb Drive retails for 7,800 yen for 128MB - quite a premium considering you can buy a 1GB pen drive for the same £40 / US$70 investment. This isn't the first creative use of a thumb drive: last month we report on FlashPEZ, a 16MB usb stick modded into various PEZ dispensers. If you think the Thumb Drive borders on bad taste, sink your teeth into the rest of the Solid Alliance range: the Food Disks, modelled around fried shrimp and other japanese food, are also only 128MB for about £40. Those of you hungry for data (groan! 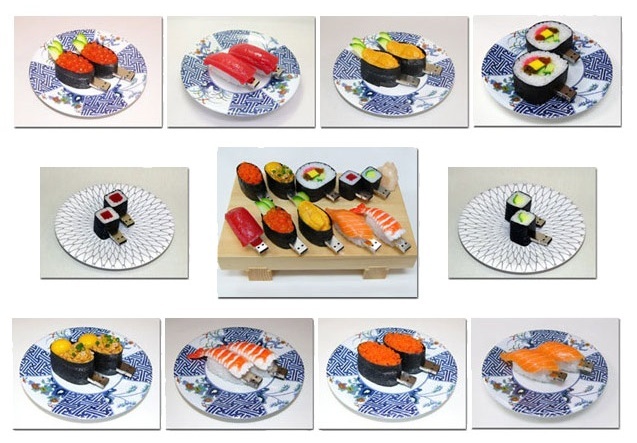 -Ed) might opt for a Sushi Disk, which is available in 1GB versions. However, at £120 / US$215, it would be cheaper to buy a regular one gig stick for a third of the price, and then treat yourself to a night out at a real sushi restaurant. In case you're wondering, plastic replica food is quite common in Asia: it is used in Food Court displays to show customers what various lunch platters look like. With that in mind, it is only natural to shove a 128MB pen drive inside, isn't it...?